“In The Game Room – Episode 1” is online. This is my goofy little video show about gaming and stuff. This is the first episode, I’m sure they’ll get better over time so don’t beat me up too much over this one. 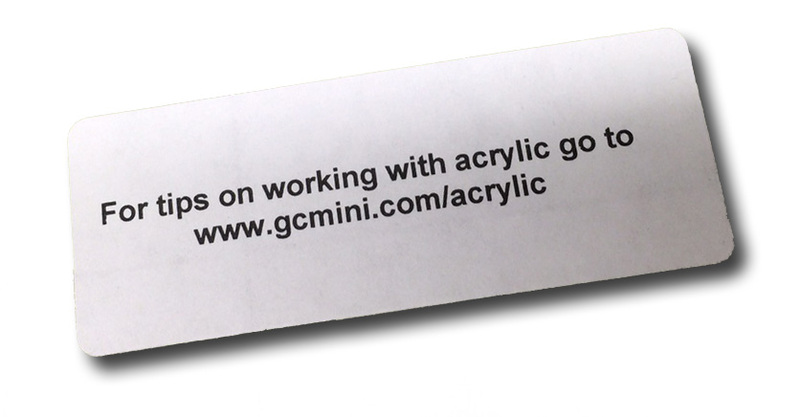 For quite some time now, every time I ship out a kit that is made of acrylic I have tried to remember to put one of these stickers on the package. The link takes you to a page with a YouTube video that teaches you about working with and bonding acrylic. At some point in the recent past the page I was sending you to simply went away and I did not notice till today. So, if you ever went looking for that page and did not find it, it’s back now. Sorry for the inconvenience.